Imagine the possibilities! 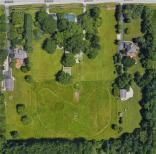 If you are a buyer looking to build your dream oasis or a developer looking for coveted land in Zionsville, then this is it! Acreage, location and character can be yours on this awesome piece of land.